[0:58] <ProfessorKaos64> is there a way I get something like retropie for x86? [2:11] <Jeebiss> How does the raspberry pi compare when it comes to making calculations in a python program vs an arduino uno? [4:52] <rikkib> wonder if there is a sensor pool? [11:05] <hadifarnoud> where can I buy PIFACE CONTROL & DISPLAY for Canada? [12:25] <kevinprince> so i have an arduino connected to my pi to chuck out GPS data via USB serial, works absolutely fine on my mac but Pi just doesnt get anything other than println from the setup block. anyone got any ideas? [12:30] <mike_t> kevinprince, arduino gets power from rpi? [12:34] <gordonDrogon> kevinprince, are you running minicom on the Pi to check, or something else? [12:36] <gordonDrogon> ok - if it prints something at startup, then nothing more, it really does suggest an issue on the arduino. [12:37] <gordonDrogon> although hard to know what if it works as planned on a Mac. [12:37] <gordonDrogon> what baud rate? [12:39] <gordonDrogon> I've done lots with Arduinos and other ATmegas off the Pi - never had any serial issues. [12:39] <gordonDrogon> there is a minor issue with the on-board serial port when you first open it, but if you're using USB you'll not see that. [13:02] <gordonDrogon> I don't use the arduino IDE, but personally, I'd dump all the else/if's. [13:04] <shiftplusone> ShorTie, thanks, I'll look into it. [13:11] <shiftplusone> ShorTie, can't find one of those in Australia. [13:16] <gordonDrogon> Bhaal, probably more reliable than the Pi directly - at the expense of more hardware though. 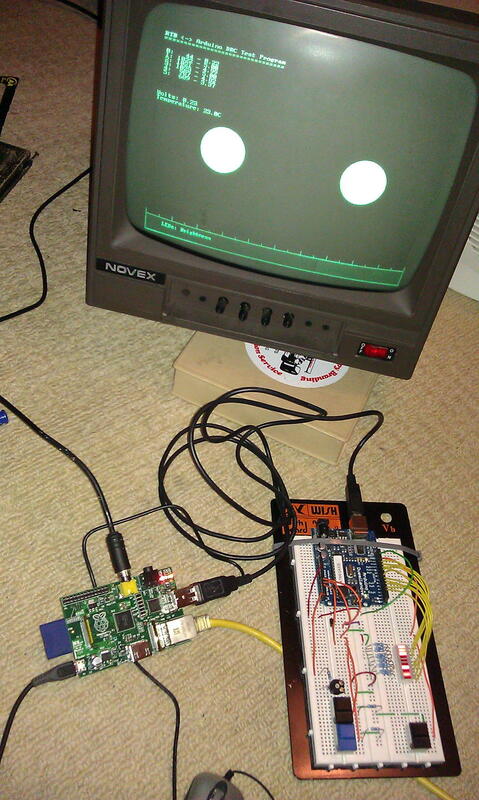 [13:17] <gordonDrogon> Bhaal, the arduino works ok on the Pi - it's a bit slow though. I've used it, but I don't use it for my proper projects - I use the compilers & makefiles directly. [13:19] <shiftplusone> ShorTie, sounds like a plan then. [13:35] <kevinprince> gordonDrogon: what if the Arduino wasnt getting enough power to do its thing? [13:37] <gordonDrogon> kevinprince, GPS's are power hungry, but I'd have thought the USB serial would be fine. [13:37] <gordonDrogon> kevinprince, you could check the output of dmesg to see if the usb serial device drops out. [14:05] <raouk> I've installed images on my PI before and have been able to ssh into them. But now, i've tried 3 different images (satellite CCRMA, rapsbian, archlinux arm), and when I plug in the ethernet cable from the pi to my macbook pro, it gets assigned an IP 169.254.116.66, and i cant reach it. any ideas? [14:11] <n3hxs> raouk, I would guess that your Mac is not assigning it an IP address since the 169.254.x.x is the default "no adddress assigned". Try giving it a fixed IP address in the console. [14:22] <Bhaal> Alright guys, which temp sensor is known to be more accurate, the 1-wire DS18B20 or the temp sensor in the DHT22 ?? [14:48] <SirLagz> also, wouldn't happen to know if 2.7V would be enough for a CMOS battery would you ? [14:51] <[Ex0r]> So, since the pi outputs 3.3 on the gpio, does that mean it takes input of 3.3 too? [14:54] <shiftplusone> Isn't it low active? [14:55] <shiftplusone> so yeah, just grounding it will do. [14:56] <[Ex0r]> on both sides ? [14:56] <[Ex0r]> do you ground it to accept input while its on, or only while its in halt ? [14:59] <shiftplusone> so you just need a switch going from the pin to ground and code to handle it. [14:59] <[Ex0r]> is it possible without anything in between? [14:59] <shiftplusone> everything that needs to be in between is already in between. [15:02] <[Ex0r]> or actually, could one gpio pin power two leds ? [15:02] <shiftplusone> I don't think so. [15:02] <shiftplusone> it can barely power one. [15:03] <[Ex0r]> ah, alright. I guess I will stick with my original plan tna. 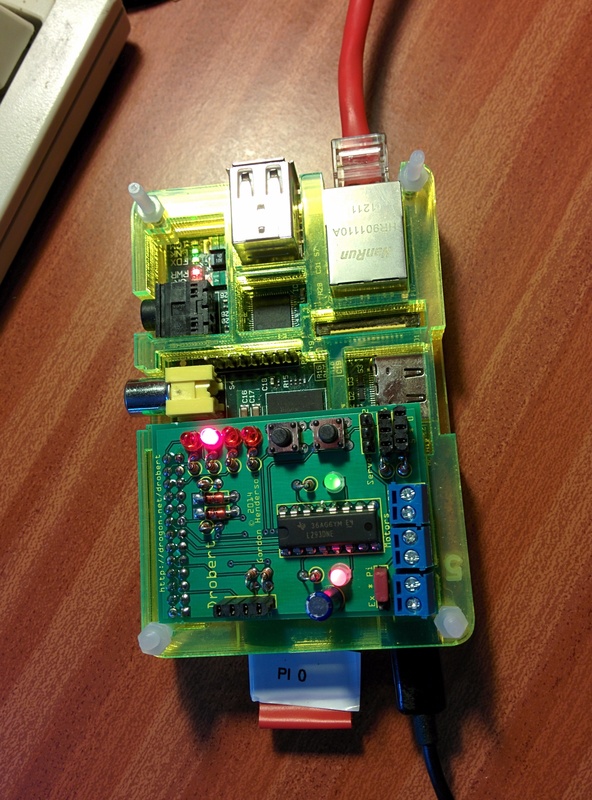 [15:03] <gordonDrogon> you can power 2 LEDs off one GPIO pin, but it's not a good idea. [15:04] <[Ex0r]> can you power 2 off two different ones? [15:04] <gordonDrogon> but if you use low power LEDs and one resistor per LED then you can get away with it. 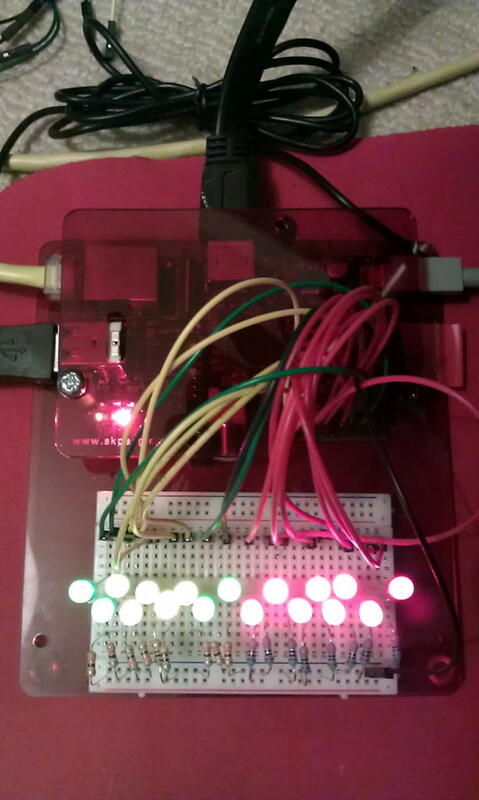 [15:04] <gordonDrogon> http://unicorn.drogon.net/pi17leds.jpg <--- 17 LEDs off 17 GPIO pins. [15:05] <gordonDrogon> you can use the gpio command from wiringPi in /etc/rc.local for a no-code solution. [15:06] <[Ex0r]> hmm, what if i dont have the bcm chip ? [15:06] <gordonDrogon> it's a Pi - you have the bcm chip. [15:06] <SirLagz> the Pi outputs composite as NTSC by default right ? [15:07] <gordonDrogon> [Ex0r], there is only one Raspberry Pi. [15:07] <gordonDrogon> 2 revisions and 2 models but they're all the same Pi on the inside. [15:08] <gordonDrogon> [Ex0r], just remember the 15mA limit per pin and (in theory) a 50 mA limit in total. [15:08] <[Ex0r]> gordonDrogon- Is that out, in, or both ? [15:08] <gordonDrogon> SirLagz, it "sniffs" HDMI first and if it thinks its connected via HDMI then it will use that before falling back to composite. [15:08] <gordonDrogon> [Ex0r], either way. [15:09] <[Ex0r]> hmm shoot... if I were to jump from pis gnd to pin 3, what mA would that give me ? [15:09] <gordonDrogon> [Ex0r], what's pin 3? [15:09] <SirLagz> gordonDrogon: tried using composite output onto a TV tuner card in a PC ? [15:10] <gordonDrogon> SirLagz, pin 3 on P1 is one of the I2C pins - it has a 1K8 pull-up resistor to 3.3v. [15:10] <shiftplusone> SirLagz, if the card has composite inputs, you should be fine. I connect my C64 that way. [15:13] <[Ex0r]> shiftplusone- is that the one you were talking about earlier ? [15:14] <shiftplusone> one used by the broadcom, one used by wiringpi and the actual physical pin numbers. [15:16] <gordonDrogon> I'm under the impression that eithe 3 or 5 will turn it back on. 5 is oft quoted as you can use a jumper link between that and the adjacent 0v line. [15:17] <gordonDrogon> however if you're hoping that it's low power in halt mode, then do check - it's still over 100mA. [15:18] <shiftplusone> [Ex0r], the 50mA max is through the chip, not for the whole board. [15:19] <gordonDrogon> it's whats left over on the 3.3v line after you take into account what the SoC can use itself when running flat-out. [15:19] <gordonDrogon> My infamous 17-led photo is pulling about 170mA. [15:20] <gordonDrogon> but the Pi wasn't doing anything else - I suspect that if I cranked up the GPU then it might get a little interesting (ie. crash). [15:20] <gordonDrogon> [Ex0r], yes, you should easilly be able to do that. [15:20] <[Ex0r]> k, that's what I was wondering. That's all I need it to do, really. [15:23] <gordonDrogon> there are plenty boards like that out. [15:24] <[Ex0r]> where do you get your pcbs printed at ? [15:25] <gordonDrogon> [Ex0r], are you in the UK? [15:25] <gordonDrogon> well I use a UK company. [15:25] <gordonDrogon> so not much use to you, I guess. [15:25] <[Ex0r]> is it expensive to get say ONE printed ? [15:26] <gordonDrogon> I pay about �80 for a single panel from a prototype place - that yielded 6 drobert boards or 3 ladder boards. [15:26] <gordonDrogon> however for production, when I ordered 300 of them, they cost under �1 each. [15:26] <shiftplusone> [Ex0r], it's the same quality you get elsewhere. [15:26] <Budd> After a server boot drive meltdown last night (yes, I had a backup, thank you), I'm considering offloading network services to a handful of pi's, for resiliance. What's a good way to physically mount 4-8 pi-Bs so they are easily powered and networked (don't care about other ports)? [15:27] <gordonDrogon> Budd, buy an HP microserver instead. [15:27] <[Ex0r]> you just send in the eagle pcb to them and they print it out and send you the cut and printed pcb? [15:27] <gordonDrogon> [Ex0r], I don't use Eagle, but yes, I send them the Gerber files and the mail me back the boards. [15:27] <Budd> gordonDrogon: The point is to insulate against single points of failure. Such as my boot drivefailure last night. [15:28] <gordonDrogon> Budd, Yea, but... I'd still use a 'proper' server myself (and do). RAID/mirrored drives, etc. [15:29] <gordonDrogon> Budd, but for Pi's - there is no "best" way - you'll need 4 power sources and maybe a means to remotely power cycle them - USB mounted drives, etc. lots of cabling - lots more to go wrong I reckon. [15:29] <IT_Sean> Budd: gordonDrogon is right... you are always going to get more performance fir a given volume of space with a proper server than a raspi cluster. [15:29] <Budd> gordonDrogon: that's what I've been doing, and will keep for our (16TB) storage. But for lightweight processing, it's nicer to have something cheap and instantly replaceable on hand. [15:29] <shiftplusone> [Ex0r], but with practice and your own equipment you can make very decent boards yourself. [15:30] <Budd> IT_Sean: I understand - but performance is not at all the issue. Reliability and ease of replacement is. [15:30] <gordonDrogon> Budd, people do it though - Pi + USB drive - not sure I'd try mirroring/raid over the Pi's single USB interface though. [15:30] <IT_Sean> Budd: if you care about reliability, a raspi cluster is NOT the way to go. With all the connections and individual parts, not to mention the lack of reliability in SD cards over time, there is A LOT to go wrong. [15:30] <Budd> I clearly haven't been clear. I'm imagining two PIs for DHCP (different address ranges), two (maybe the same) for DNS servers, etc. [15:31] <shiftplusone> [Ex0r], try the uv exposure method with transparencies instead of toner transfer. [15:31] <gordonDrogon> Budd, just do it - they're just little linux boxes afterall. [15:32] <shiftplusone> [Ex0r], what etchant did you use? [15:32] <Budd> gordonDrogon: right. And they can join my community mesh network natively, which is cool: remote cameras that can maintain connectivity as they travel. [15:32] <gordonDrogon> Budd, but I think there is no "best" way - everyone will have their way - my way is to not have a rack full of spagetti wiring. [15:34] <gordonDrogon> Budd, look at the "Pi Cluster" stuff - however I don't think any of them use anything more than th local SD card. [15:34] <gordonDrogon> but you can do it in Lego. [15:34] <shiftplusone> [Ex0r], I recommend trying again. I also recommend bugging ReggieUK about it too, since he seems to have the hang of it. [15:35] <Budd> gordonDrogon: I have a 4-port USB power supply, which (with very short cables) shouldbe fairly neat. [15:35] <shiftplusone> [Ex0r], aren't they all over the place (libraries, office supply shops and so on)? [15:36] <shiftplusone> and as I said... transparencies and uv exposure, not toner transfer. [15:37] <shiftplusone> Why not use an iron and a rolling pin? [15:38] <shiftplusone> That was my first attempt... photo paper, laser printer, transfer with an iron and a rolling pin, soak the paper in water until it floats to the top, then etch in HCl and hydrogen peroxide. [15:39] <shiftplusone> It wasn't pretty, but the board worked like a charm. [15:48] <[Ex0r]> shiftplusone- would one ground pin on the pi work on both leds and the switch or do you think each one should use its own pin ? [15:51] <shiftplusone> ground is ground, no matter what pin you use. In theory, anyway. There are other effects to worry about, but not in this case. [15:58] <stopgap> I'm new to all this, sorry if I have any terminology mixed up there! [16:00] <shiftplusone> I don't know, but you should mention what 'high load' is exactly, since it's all relative. Got any numbers? [16:00] <gordonDrogon> stopgap, you don't need the mcp23017, but the output driver is the same with or without. [16:00] <gordonDrogon> but yes, as shiftplusone said - what sort of current? [16:02] <gordonDrogon> stopgap, all at the same time - so just one output switching all of those at the same time? [16:06] <gordonDrogon> I'd look at one output driving many logic level power mosfets. [16:07] <stopgap> OK, can you suggest any? [16:07] <gordonDrogon> so one mosfet for those 40 LEDs (each with their own limiting resistor), one for both vibration motors, one for each of the other motors, etc. [16:07] <gordonDrogon> those are direct connect. [16:08] <gordonDrogon> do use a diode on the motors though. [16:08] <stopgap> I was going to wire the LEDs in series in groups, to meet the 12v, without resistors - is that correct? [16:08] <gordonDrogon> stopgap, no - don't wire LEDs in series - they'll be different brightnesses. [16:09] <gordonDrogon> still use a resistor though - e.g. if you have 1.8v LEDs then 6 LEds plus a resistor to make up the balance. [16:09] <gordonDrogon> you'll need them in parallel then! [16:09] <gordonDrogon> else they won't fire at all. [16:11] <stopgap> so the MCP23017 has a max of 120a (I think) so I can drive 4 of those mosfets with it, correct? [16:12] <gordonDrogon> er - the gate current on those is virtually zero. [16:13] <gordonDrogon> drive it from the Pi - unless you really need that mcp23017 for something else. [16:15] <stopgap> it seemed cheaper than a new Pi! [16:15] <gordonDrogon> you could drive everything from a single relay - but you need something to drive the relay - e.g. a PiFace board. [16:16] <gordonDrogon> that would also isolate the Pi from the 12v side too. [16:16] <stopgap> would I be correct in thinking relays would use a higher current? [16:16] <gordonDrogon> yes - so you need a driver for the relay - like the PiFace board which has it built in. [16:17] <gordonDrogon> as long as you weren't going to switch it on/off very fast - e.g. no more than 2-3 times/second. [16:18] <gordonDrogon> so a PiFace would make your life easier. it also has 2 relays. [16:18] <gordonDrogon> optos would work, but add complexity. [16:20] <gordonDrogon> �20 from cpc. almost worth it to save you buying the mosfets and wiring them up. [16:21] <gordonDrogon> and you can program it in C, BASIC and Python, etc. [16:21] <gordonDrogon> I don't use Python, but there are plenty others here who do. [16:33] <[Ex0r]> is that normal when building wiringPi ? [16:43] <gordonDrogon> [Ex0r], is the LED in the right way round? [16:43] <gordonDrogon> anyone got 5 minutes to test a .deb package install under Raspbian for me? [16:44] <gordonDrogon> it shouldn't - it's a debian package - then you can remove it afterwards. [16:45] <[Ex0r]> is it cause the resistor is a 220 for such a low voltage led ? [16:45] <[Ex0r]> Selecting previously unselected package rtb. [16:46] <gordonDrogon> it's because the LED is designed to run with more current/vigher voltage than the Pi can give. [16:46] <gordonDrogon> [Ex0r], you have proved the concept, you just need to get a more suitable LED. [16:46] <gordonDrogon> ah, you're not running X then? [16:47] <gordonDrogon> you need to look for 1.8 or 2v LEDs. [16:48] <gordonDrogon> ok. you can get lower voltage blue ones, but you need to look. meanwhile you'll need a transsitor to connect it to the 5v supply. [16:48] <gordonDrogon> and a resistor. [16:49] <gordonDrogon> it's the only way to make a 4v led light bright off a 3.3v gpio pin. [16:49] <[Ex0r]> but, with it being dim like this, will it burn out the led quickly ? [16:50] <gordonDrogon> LEDs only burn out when you give them too many volts. [16:50] <gordonDrogon> you could try a 100Ω resistor, but you're over the limits on the Pi then. [16:51] <gordonDrogon> which pin is it connected to? [16:52] <gordonDrogon> it will be less than that due to the LEDs effectivel resistance. [16:52] <gordonDrogon> but let me know what pin and I'll give you the gpio command to turn it on. [16:53] <gordonDrogon> ought to turn it on, and gpio write 11 0 will turn it off. [16:53] <[Ex0r]> well wont it turn off automatically once the pi goes to halt anyway ? [16:54] <gordonDrogon> you probably used pin 7 in your script. [16:54] <gordonDrogon> yes, it will, but its handy to be able to turn it off to test. [16:54] <gordonDrogon> the -1 flag says to use the P1 pin numbers. [16:55] <IWishIKnew> anyone use Boost library for filesystem management with C++? [16:56] <[Ex0r]> and I can add that right to /etc/rc.local huh ? [16:56] <gordonDrogon> [Ex0r], yes, that'll work. when putting it in /etc/rc.local, use /usr/local/bin/gpio ... you need the full pathname to the commands. [16:56] <IWishIKnew> [Ex0r]: you mean "then"
[16:57] <gordonDrogon> [Ex0r], yes - the script will need to be run in the background and you can use the gpio wfi instruction to wait for the button to be pushed. [16:58] <gordonDrogon> if the script is running as root, you just need /sbin/halt - no sudu, etc. [16:58] <IWishIKnew> gordonDrogon: it is safe to use root. [16:58] <IWishIKnew> gordonDrogon: that way, the user doesn't have to run the entire program as root, creating a potential security risk. [16:58] <gordonDrogon> gpio wfi - is wait for interrupt. it will wait without using any cpu until the pin goes to the waited state. [16:59] <[Ex0r]> so on startup just make a sh script that runs gpio wfi ? [16:59] <gordonDrogon> that's the simplest way. [17:00] <[Ex0r]> is gpio wfi documentation on the website ? [17:01] <gordonDrogon> the wfi is relatively new and the website is a little behind. [17:01] <gordonDrogon> however the man page has it. [17:02] <gordonDrogon> although I'd need to double-check - it might be that it needs the bcm_gpio pin number. there is confusion there. [17:03] <gordonDrogon> then it should wait - ground the pin and it should return. [17:03] <gordonDrogon> it's a 2-line script - the gpio command, then the /sbin/halt command. [17:04] <gordonDrogon> I gotta go too. my kitchen calls. [17:05] <IWishIKnew> do yall ever do anything more advanced with the raspberry pis as far as programming is concerned? [17:09] <[Ex0r]> bahaha it works gordonDrogon! [17:09] <IWishIKnew> do yall ever do anything more advanced with the raspberry pis as far as programming is concerned? [17:23] <Tzvish> I have a problem with booting my raspberry :( I get a dialog that asks my to enter root password on boot or press ctrl + d and then everything works fine - any idea? [17:24] <IWishIKnew> Tzvish: your pass, by default, is "root"
[17:24] <Tzvish> actually i didn;t have a pass for root, i used passwd to change to raspberry, how do I remove this dialog from boot though ? [17:25] <IWishIKnew> shiftplusone: that's not true. [17:26] <IWishIKnew> linux has a default login: root, root. [17:26] <shiftplusone> IWishIKnew, that's now what he's asking. [17:28] <shiftplusone> that's Arch, right? [17:31] <atouk> are you running any custom statup scripts? [17:32] <agrajag> isn't the password 'hunter2'? [17:44] <Tzvish> ok wtf, this is not related to the custom .bashrc or the inittab modifications... why is this happening then ? [17:46] <IWishIKnew> [Ex0r]: stop plugging crap into random sockets and use ohm's law. [17:47] <[Ex0r]> gordonDrogon you here by any chance ? [17:47] <IWishIKnew> you got it in a series. [17:48] <IWishIKnew> it doesn't matter if it uses 2 pins, or one. [17:48] <IWishIKnew> you need to wire it in parrallel. [17:48] <IWishIKnew> from the same source. [17:48] <[Ex0r]> Its two GPIO pins. Two different sources. [17:49] <shiftplusone> [Ex0r], could you draw a schematic of how you have it wired up? [17:49] <IWishIKnew> [Ex0r]: then obviously one pin has a lower current output than the other. [17:49] <IWishIKnew> you need to check that before you fry your pi. [17:53] <shiftplusone> Tzvish, nope, that's not a statement that makes sense. [17:53] <shiftplusone> [Ex0r], are they different colour LEDs? [17:54] <IWishIKnew> [Ex0r]: you need to figure out how much current is comming from the two pins. [17:54] <IWishIKnew> obviosuly less if coming from one of them. [17:54] <shiftplusone> [Ex0r], what's the voltage drop across each LED? [17:55] <shiftplusone> [Ex0r], i meant measured. [17:57] <IWishIKnew> Tzvish: then you need to learn about linux. [17:57] <IWishIKnew> Tzvish: because that's what you're using. [17:59] <shiftplusone> Tzvish, it's kind of hard for us to know how to diagnose the problem since there have been changes made by your and your friend which we can't know all of, nor can we believe that you've undone them cleanly. If it was reproducible, maybe I could help. I've only seen it drop to maintenance mode when things failed quite verbosely. [17:59] <IWishIKnew> Mint is so awsome, I never looked back after switching from Winouze 8. [18:00] <shiftplusone> [Ex0r], any chance you hooked up the LED without a resistor before or miswired it in some other way? [18:01] <[Ex0r]> dont know what would have happened, it could just be it was a bad led ? [18:02] <shiftplusone> and if you switched them around correctly and one LED works and the other doesn't in an identical circuit then.... that kind of narrows things dowwn. [18:03] <IT_Sean> Very likely IS a bad LED, in fact. [18:04] <shiftplusone> I don't think a second with a lighter would do anything. [18:05] <[Ex0r]> would it be easier if I snap a pic for you to see ? [18:08] <shiftplusone> it would be a short circuit.... a pi-frying short circuit. [18:09] <shiftplusone> some questions science can't answer, [Ex0r]. Clearly, it's haunted. [18:12] <shiftplusone> Well, if you did ask, I would say no, that wouldn't make sense. [18:21] <Tzvish> ok guys the solution was to remove single user only mode from cmdline.txt in the boot partition - it had an extra capital S in the end of it. [18:23] <hypfer> any source of a cheap and large LCD? [18:25] <shiftplusone> hypfer, I don't know what a magic mirror project is, but I am guessing you want a proper colour LCD rather than just a character or dot matrix LCD? [18:27] <shiftplusone> I think if you try to use GPIO for this rather than HDMI, you're going to have a bad time. [18:27] <hypfer> any idea where I can ask for that? [18:31] <hypfer> ShorTie: i think the problem with tvs is, that the hardware to control it is.. huge. [18:49] <pineappleclock> (?) would the GPIO on a raspberry pi not provide enough current to run some hi-eff IR LEDs to use as illumination for a noir camera? [18:50] <gordonDrogon> pineappleclock, not really. buffer with a transsitor of some sort. [18:59] <Tzvish> I want my raspberry pi to turn on the light, where do I start ? [18:59] <gordonDrogon> Tzvish, at the begining. [19:00] <gordonDrogon> Tzvish, can you program? [19:01] <gordonDrogon> Tzvish, what about interfacing - what voltage is the light? [19:02] <gordonDrogon> personally, I'd start with an LED. [19:02] <Tzvish> can i power a night time LED so when I enter the house i'll write a motion script to activate it? [19:02] <gordonDrogon> using a PIR sensor? [19:03] <gordonDrogon> is motion a camera thing? [19:03] <gordonDrogon> ok - well then you just need the LEd thing. [19:04] <Tzvish> gordonDrogon: thanks looks good, where do I buy this ? [19:05] <gordonDrogon> Tzvish, you need to find a local shop/online place that will sell you LEds and resistors. [19:07] <gordonDrogon> you could canibalise old electronics for bits? [19:09] <IT_Sean> you live in a hole? [19:09] <IT_Sean> like... an actual hole? [19:12] <IWishIKnew> if I dig a randome hole somewhere, big enough for me to live in, and stick up a mailbox, you think the mailman will deliver my mail? [19:14] <gordonDrogon> [Ex0r], do you have the voltage rating on those? [19:17] <gordonDrogon> [Ex0r], no - normally open is fine. [19:17] <[Ex0r]> wouldnt that always put current through though ? [19:17] <gordonDrogon> no - normally open means they're open circuit. they allow current to flow when closed. [19:22] <[Ex0r]> okay so than yeah, they are the right ones.. that means no current can pass through it right ? [19:22] <Tzvish> ok thanks for everything guys im out to eat sushi with a super hot babe. [19:23] <IT_Sean> [Ex0r]: It's probably his sister. [19:51] <dRbiG> any ideas on how to debug an sd card that reads fine externally but does not boot at all? [19:52] <shiftplusone> does the ACT LED flash at all when you power up the pi? [20:11] <gordonDrogon> and my cakes look fine. [20:12] <IT_Sean> I'm still working on Cake over TCP. [20:12] <gordonDrogon> one will be in the shop for sale tomorrow though - by the slice with coffee ... or tea. [20:34] <amstan> would it be possible to change the uart driver to reverse the polarity of the uart? [20:35] <amstan> that reminds me, is there any documentation on that uart hardware? without having the pay for NDAs? [20:35] <shiftplusone> documentation for which hardware? [20:38] <amstan> so i'm guessing there's a linux driver for that, which makes the ttyS0 port, does anyone know offhand how to find it? [20:39] <amstan> shiftplusone: do you know how much of that is raspberrypi specific? [20:43] <[Ex0r]> i wonder, is it normal for some of the pins to activate when power is applied to the pi ? [20:43] <shiftplusone> amstan, just checked the documentation... looks like the uart part is not very pi-specific at all. [20:44] <gordonDrogon> [Ex0r], so never ever rely on them. [20:50] <gordonDrogon> [Ex0r], the LEDs on the SPI pins? it might be that the SPI driver is being loaded - type: lsmod | grep spi and see what you get. 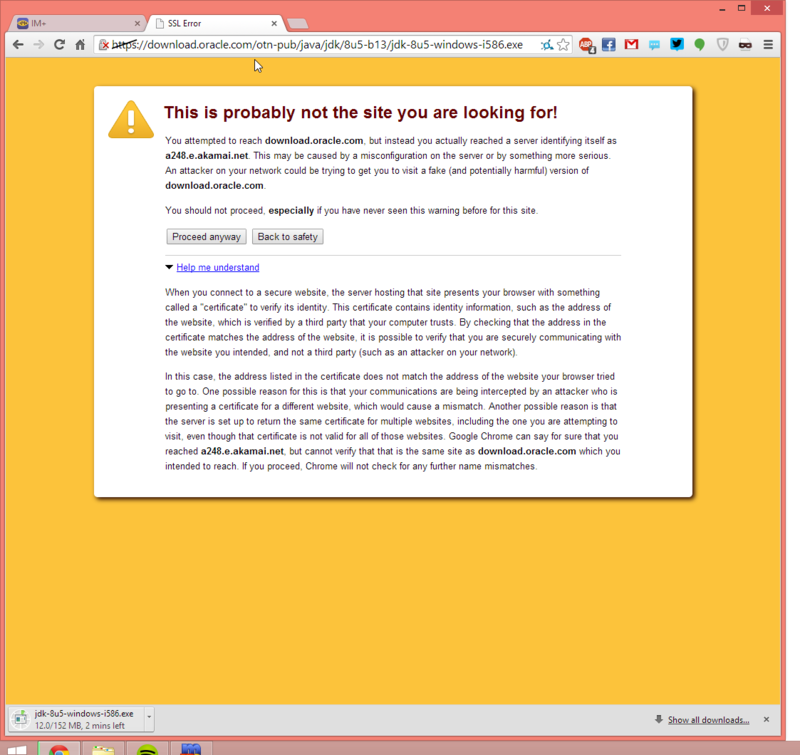 [21:25] <shiftplusone> but it means that there is a problem with the SSL certificate. It does not match the domain it's for. [21:25] <shiftplusone> But I guess I'd just be repeating that it says in the text. [22:50] <Seahonk> Hey, I'm relatively clueless, but I'm thinking of getting a raspberry pi for tinkering. I've got a project in mind, and I'm wondering if anyone can tell me whether a raspberry pi is capable of what I'd be asking of it? I want it to, on boot, load and play a pandora station, and an instance of rainymood, and a NOAA radio stream. [22:50] <Seahonk> I would want it to then adjust the volume on the NOAA radio and Pandora. Then pick a random video file from a server and play it. If it has resources left over, I want it to overlay a newsticker and a unix clock on the video. [22:51] <[Ex0r]> Seahonk- People use it for full on media centers and security systems, so i'm pretty sure it could handle that. [22:52] <Seahonk> That's good to hear. [22:52] <mgottschlag> does pandora work on the pi? [22:52] <MrVector> Is that the American version of Spotify? [22:54] <Seahonk> Any suggestions for getting a ticker and a clock overlaid on the video? Everything else is just "get file and play it," but I'm not sure how I could do that one. I haven't really done this sort of thing before. [23:14] <funkster> damn, so i need to move off RPI for this project due to CPU being a bit too slow, what is my next step up that i can serial into? anyone know? [23:15] <mgottschlag> funkster: any special GPIO requirements? [23:18] <funkster> beaglbone black was unstable when i tested. [23:20] <gordonDrogon> funkster, family friendly channel please. [23:35] <rikkib> Is the cable your using passive? [23:41] <mgottschlag> rikkib: if he is already running his program, I think he would have noticed if he could not open the tty file. [23:49] <ckoch786> rikkib, was it the same setup as per http://elinux.org/RPi_Serial_Connection ? [23:56] <[Ex0r]> bahahaha, its done!